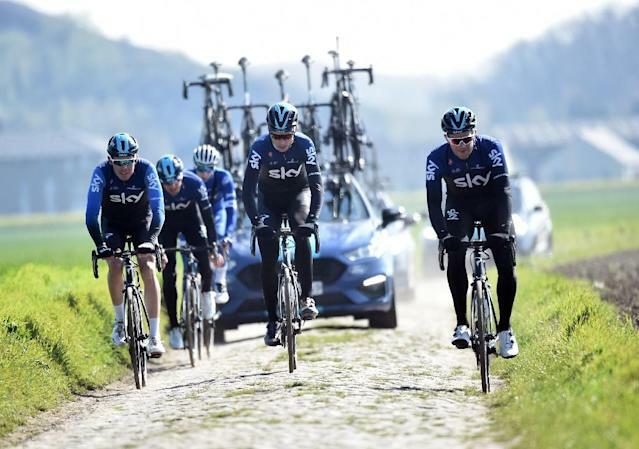 Compiègne (France) (AFP) - British cyclist Luke Rowe is plotting a winning send off at the cobbles classic Paris-Roubaix on Sunday where he says he will be unemotional about pulling on the iconic Sky jersey for the very last time. Tour de France winning Team Sky key duo Chris Froome and Geraint Thomas are away preparing for the 2019 Tour, which they will contest under a new banner after Sky decided this year to end its partnership with Dave Brailsford's team. Rowe's team will be renamed Ineos, after the company owned by British energy and plastics magnate Jim Ratcliffe in a deal starting in May, but Rowe was far from bleary eyed about the change. Speaking to AFP outside Napoleon III's former residence at Compiegne in a packed and raucous square which serves as the start gate for Sunday's epic 257km classic, the Welshman looked relaxed, fit and ready to fight for one last Sky win. "Winning for the team here at Paris-Roubaix would be a pretty cool send off wouldn't it?" "When you're pulling the Sky jersey on for the last time, it would be pretty special. On one level Sky or Ineos or whatever we have on our chest doesn't really matter, but It'll be the last time I personally ever pull a Sky jersey on for a race," the 29-year-old said. "I'm not racing at all in the rest of April." "I wouldnt say it was emotional because we are staying together, if the team was folding and we were all going our separate ways I think that would change things but the fact that it's pretty much just going to be the same apart from the jersey and the name." Sky have won eight Grand tours over their 10 year tenure but have had less success at the one day races known as classics or in Sunday's case Monuments for energy sapping extra length. Rowe, backed up by Itay's Gianni Moscon and Dutch roller Dylan Van Baarle, said he felt the time was ripe to improve on some recent near misses. "This is a strong team and we came here to win a big race," he insists. "Everyone hopes lady luck is on their side but I think this is a race that actually suits us as a squad better than the Flanders classics, where we've been the past few weeks." Asked if the notorious cobbles held any fear for him Rowe narrowed his eyes and suggested it would be the same for everyone. "It's bumpy, its horrible, its brutal." "I'm sure everyone would say the same about the cobbles sections. How tough they are, how brutal they are and how relentless it all is." "But it's the last time, winning for the team here, imagine how cool that would be. The tall, lithe, powerhouse of a rider Rowe has ridden for both Thomas and Froome on Grand Tour and after taking a week out after Sunday's slog he will focus his attentions on what he describes as the next big race, the Tour de France. He did reveal that there was little talk of any power struggle between Froome and Thomas after the latter emerged as the winner of a two pronged approach to the 2018 Tour. "They are both taking a patient approach toward the Tour," he said smiling. "Froomey is up in Tenerife and G (Geraint Thomas) is in the Basque Country, they are just getting miles in their legs and are fully focussed on the Tour. "It's a huge goal for both of them. Its a steady progression and a slow build up, hopefully we'll all be ready," he said.